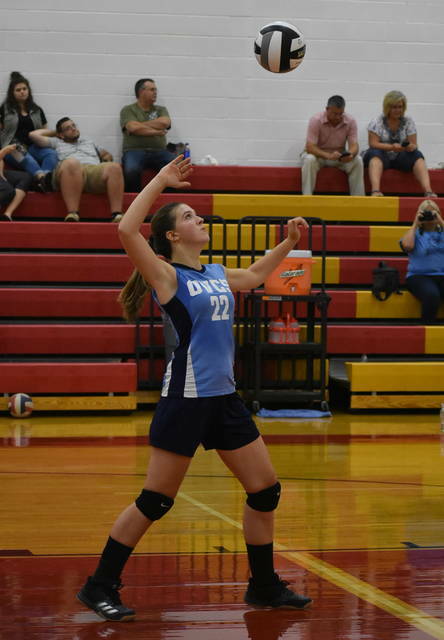 SGHS sophomore Emma Shamblin (12) attempts a dig during the second game of the Lady Rebels’ straight-sets victory over OVCS on Tuesday night in Mercerville, Ohio. MERCERVILLE, Ohio — A night of firsts. 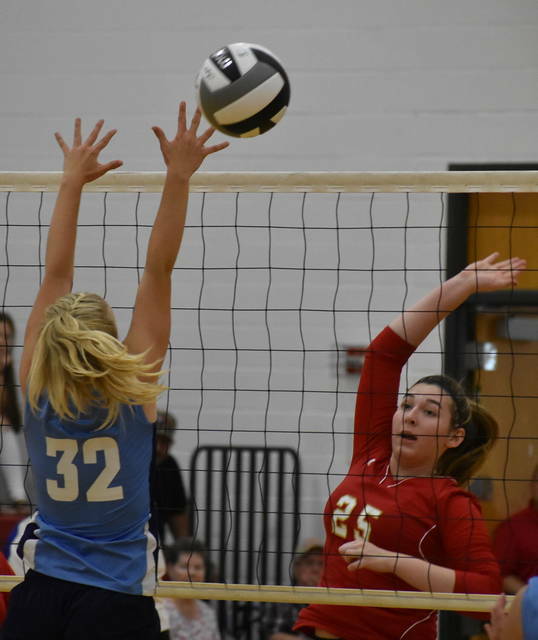 The South Gallia volleyball teamed claimed a three games to none victory over non-conference visitors Ohio Valley Christian in the home opening contest for the Lady Rebels Tuesday night in Gallia County. 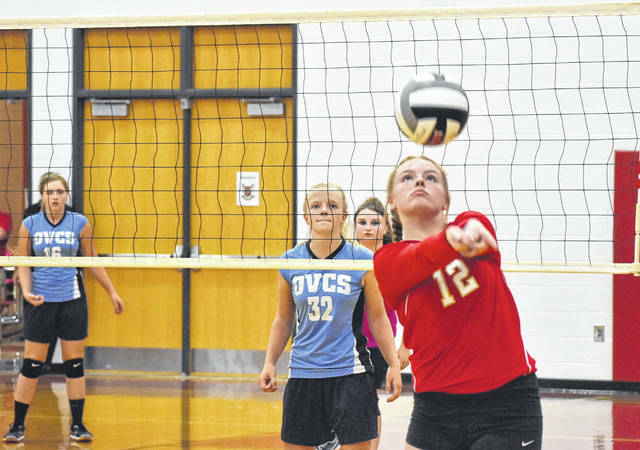 SGHS (1-1) earned its initial win of the season — following Monday night’s season-opening loss at Symmes Valley. OVCS (0-1) — playing in its season-opening contest — led 1-0 in the first game, but South Gallia scored the next 10 points and never trailed again en route to a 25-10 win. After five ties early in the second game, the Red and Gold opened up a five-point, 17-12, lead. The Blue and Gold cut the deficit to 17-14, before South Gallia utilized a 8-to-4 run, en route to a 25-18 victory. The Lady Rebels led wire-to-wire in the finale, taking the 25-11 win. Following the match, SGHS third-year head coach Sarah Shirley was pleased with her team’s performance and spoke about areas in which the squad can improve moving forward. The Lady Rebels service attack was led by senior Rachal Colburn with 19 points and sophomore Emma Shamblin with 14. SGHS junior Chrsitine Griffith posted 10 service points, while junior Amaya Howell was next with seven, followed by sophomore Faith Poling with two. The Lady Defenders service attack was led by sophomore Laura Young with six points, while freshman Chloe Payne followed with five. Seniors Makala Sizemore added three points, Emily Childers finished with two points and Kristen Durst rounded out the OVCS service attack with one point. For OVCS first-year head coach Andrea Roberts, the setback was an opportunity for her young players to gain experience and learn. “The first game we came out and just looked a bit scared,” Roberts said. “That’s not the team that I know we have because this team has a ton of potential. There’s a handful of really young players on this team and I think this being our first game, they were a bit nervous. The second game, however, I saw a lot more of the team I know. The teams are scheduled to meet again at OVCS on Sept. 10 in Gallipolis. The Lady Rebels return to action on Thursday as they host River Valley, while the Lady Defenders are back on the court on Friday against visiting North Pleasant.